Pitti Palace, in Italian Palazzo Pitti, is located on the south side of the river Arno in Florence Italy. 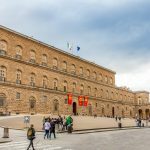 The palace was built in 1458 based on a design by famous architect Filippo Brunelleschi. The Pitti family, who where the richest family in Florence during a 300 year period, had the palace built as a residence. In 1549 Eleonora from Toledo bought it from the Pitti family and now it belonged to the Medici family who connected Palazzo Pitti to Palazzo Vecchio through the famous Vasari Corridor over the Ponte Vecchio. 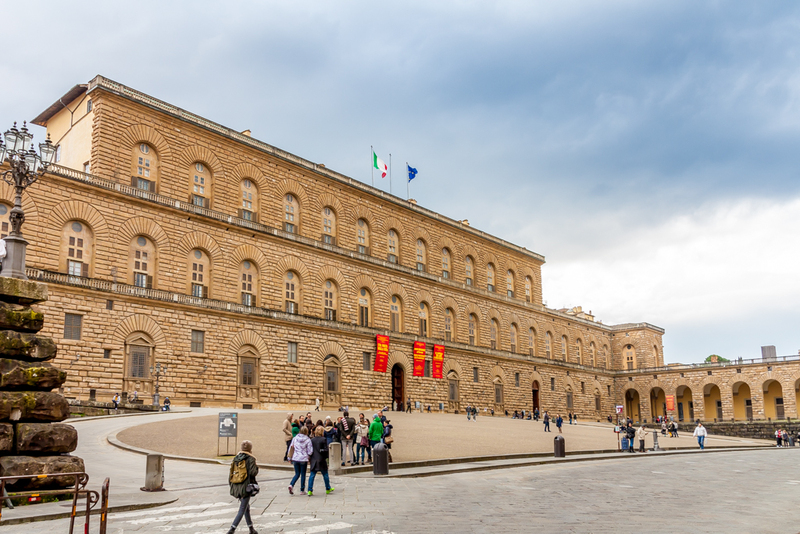 When Palazzo Pitti changed owners in 1737 the art collection which the Medici family had acquired in the palace now was given to the city of Florence, where it still is. Titiaan, Botticelli, Tintoretto, Antonio Canova, Andrea del Sarto, Caravaggio, Perugino, Fra Filippo Lippi and the Madonna del Granduca by Raphael. This Madonna painting created by Raphael in 1513-1514, is a very famous piece of art that is even used as an image itself by the French painter Ingres, who worked it into the carpet of a painting where he portrayed Napoleon. Also Maria Montessori was very keen on this Madonna della Seggiola by Raphael and wished a copy of it would hang in every Montessori school. This is one of the best works by Raphael, most probably painted for Pope Leo X of the Medici family. In this period of his career, Raphael sets free from the influence of Leonardo da Vinci.